A Tampa engineering student acquitted of terrorism-related charges walked out of an immigration court a free man earlier this month, after a judge rejected the U.S. government's bid to deport him to his native Egypt on identical charges. Yet the same immigration judge sided with Department of Homeland Security lawyers last year when he ordered the removal of a Miami man to his native Haiti after he had been acquitted of terror-conspiracy charges. Why did the immigration judge, Kenneth Hurewitz, grant the release of Youssef Megahed yet order the deportation of Lyglenson Lemorin? The lawyer who represented both men says it's because the evidence was stronger in the Lemorin case, though he disputes it was enough to deport him. Kuck said he believes Lemorin -- one of the so-called Liberty City Seven defendants -- has a good shot at his appeal, which will be considered this fall. Lemorin, 34, remains in custody. Both Megahed and Lemorin are legal U.S. residents with no criminal histories who have lived in this country for years. Both also experienced a rare kind of ``double jeopardy'' -- being charged a second time in immigration court following acquittals in federal court. Megahed, a 23-year-old former student at the University of South Florida, was arrested on a 2007 road trip in South Carolina along with a fellow classmate, Ahmed Mohamed. Both were charged with transporting explosives after police found model rocket propellants in the car's trunk. Mohamed was also charged with providing ``material support'' for terrorism, because he created a You Tube video that showed how to convert a remote control toy vehicle into a bomb. He pleaded guilty to that charge last spring. In early April, Megahed was acquitted in Tampa federal court on the explosives charges after his defense attorney argued that the materials found in the trunk -- PVC pipe and chemicals -- were homemade fireworks. But a few days later, Megahed, while leaving a Wal-Mart store with his father, was arrested by Immigration and Customs Enforcement agents. He was charged again with the same terrorism-related explosives offense, only this time in immigration court, which is part of the Justice Department and has a lower standard of proof. Megahed, who has lived in the United States since he was 11, faced deportation. His family, the Muslim community and others -- including four jurors in his criminal case -- expressed outrage. They should be outraged. I'm sorry but if you are acquitted in federal court, immigration shouldn't be able to recharge you with the same conduct and be able to deport you based on a lower standard of proof. My prior coverage on this issue is here. "Gov. Charlie Crist and ex-aide George LeMieux cleared in federal probe"
Gov. Charlie Crist and former chief of staff George LeMieux -- the subjects of a federal public corruption investigation -- have been cleared of allegations that they tried to thwart a state criminal probe into a Fort Lauderdale insurance company, according to sources familiar with the ongoing case. Crist's selection of LeMieux to replace U.S. Sen. Mel Martinez would not have been possible had LeMieux still been under scrutiny by federal prosecutors investigating alleged influence-peddling by Mutual Benefits and its former top executive. LeMieux was in the cross-hairs of the investigation after a major Republican fundraiser working with the FBI made a secretly recorded phone call to LeMieux at the governor's office in 2007, trying to get LeMieux to implicate himself, sources said. But the phone call backfired: LeMieux immediately reported it to Crist's general counsel, who called the FBI. Still, LeMieux remained under investigation through much of 2008, along with Crist and several other members of his inner circle from his tenure as Florida attorney general and then as governor. U.S. District Judge Reggie B. Walton went further than any of his District Court colleagues has gone in cutting back on the Pentagon’s option of proving its detention cases by using a kind of evidence that normally would not be allowed in court — hearsay, as a substitute for direct proof of facts. The judge refused to follow the government’s plea that all of its hearsay evidence about an individual detainee should have a special rank, admitted into court with a presumption that it was reliable unless detainees’ lawyers could show it was not. Judge Walton’s 12-page order outlining a “framework” for processing government offers of hearsay evidence can be downloaded here. 3. Interviews for the U.S. Attorney slot and the District Court slot will happen next Wednesday, September 2. Unfortunately, they are not open to the public. 4. One of the judicial candidates, FPD Kathy Williams, is receiving UM's Lawyers in Leadership Award, which recognizes “dedication to public citizenship and leadership.” Rick Bascuas covers it here. 5. Miami officer pocketed Crime Stoppers reward cash (via Miami Herald). To keep up the PD theme, I'm sure a PD got assigned to one of the defendants in the case. 4. The government’s search protocol must be designed to uncover only the information for which it has probable cause, and only that information may be examined by the case agents. See pp. 11878, 11880-81 supra. My former law-school classmate, Professor Orin Kerr, has been railing on the decision over at the Volokh Conspiracy. Professor Kerr calls the opinion "breathtaking"** and says that it is light on citations to authority. He goes so far as to say: "This is the most free-wheeling, 'look ma no hands' legal decision I've read in a long time." I think Kerr has got it all wrong here and that the en banc 9th Circuit has got it right. Computer searches are inherently different than any other type of search. And by the very nature of the search, a search warrant for any type of digital information -- no matter how discreet -- will lead to a search of the entire computer. Nowadays, there is nothing more private than a computer, not even your home. The old 4th Amendment analysis plainly hasn't been working with searching computers. And finally, one court had the courage to say so. I know this isn't Scalia-Dershowitz, but I challenge my old friend Orin to a debate on whether this case was correctly decided. We can do it in blog posts or email or whatever. I hope he accepts. My first question to the good professor is whether he would agree that computer searches are inherently different than any other kind of search. *Isn't it interesting that Kozinski wrote this opinion. Remember that he's the guy who had the contents of his computer publicly disclosed. **Interestingly, the same word was used to describe the government's position: "Judge Thomas, too, in his panel dissent, expressed frustration withthe government’s conduct and position, calling it a 'breath-taking expansion of the ‘plain view’ doctrine, which clearly has no application to intermingled private electronic data.' Comprehensive Drug Testing, 513 F.3d at 1117." Miami-Dade Circuit Judge John Schlesinger looks like he could play a judge on TV. Good looking, with a full shock of iron-gray hair and a granite jaw, Schlesinger is telegenic. But it’s his wife, Marilyn Milian of “The People’s Court,” who’s the television judge, and that helps explain why Schlesinger reported a net worth of $7.18 million, including a $2.7 million Coral Gables home, $1.8 million in the bank and a $95,000 Aston Martin sports car. So DBR peeps, is the federal judge list coming next? Should judges reject agreed to plea agreements? We've discussed this issue many times on this blog. If two parties in the adversary system work out a deal, should the judge be able to reject it? (Along the same lines, should a judge be able to reject a civil settlement?) I think the answer is clearly no for reasons I've articulated before. The issue has come up again, this time out of the district. This time some (alleged?) crooked judges agreed to plead guilty in exchange for a particular sentence agreed to by the prosecutor. The federal judge rejected the deal in this order, in part because of the "scandalous conduct" of the judges. What say you, readers? Are you persuaded by the court's reasoning? Should judges be permitted to reject the deals made by the parties to the lawsuit? Is there a better comedy than Ferris Bueller's Day Off? Summer's over -- there's gotta be something good going on. You know it's slow when SFL is comparing Tom Julin to Kingpin and Rumpole is already doing football posts. BTW guys, check out this article -- anonymous bloggers are being outed. And is it me, or is it wrong to put someone (this time Richard Hatch) in jail for giving an interview while at a halfway house? There are times, however, when it's better to just keep quiet. We covered earlier the UBS defendant who was asking for probation for his extensive cooperation. The government was asking for 2 1/2 years (or a 50% reduction). Judge Zloch today sentenced Bradley Birkenfeld to 40 months, or 10 months more than the government asked for. (Here's the AP story). What say you, readers? When, if ever, is it appropriate for a judge to sentence above the parties' recommendations? (I think the answer is probably never, but I'm happy to hear arguments to the contrary). Richard Strafer and Howard Srebnick had a big win in the Eleventh Circuit this week in United States v. Kaley. Judges Marcus, Wilson and Tjoflat reversed and remanded the district court's decision not to permit the Defendants to challenge the pretrial restraint of assets they wanted to use to hire their counsel of choice, Howard Srebnick and Susan Van Dusen. Judge Marcus wrote that the Court was bound by United States v. Bissell, 866 F.2d 1343 (11th Cir. 1989), which held that a defendant is only entitled to such a hearing if he meets the Barker v. Wingo balancing test. Here, clearly believing that there should have been an evidentiary hearing, the Court determined that the trial court had failed correctly to balance the Defendants’ assertion of their right to a hearing and the prejudice to them of its denial. Judge Marcus especially noted the prejudice to the Defendants of being deprived of their counsel of choice, calling that a “powerful” form and “substantial source” of prejudice. The Court sent the case back for a correct evaluation of the factors to determine whether a hearing should be held. The DBR reports that the mold lawsuit filed by Ted Klein's family has been dismissed by Judge Story. Apparently, you can only get $1,000 under the Federal Employees Compensation Act when death results from on-duty injuries of a federal employee. Readers, can this law be constitutional? That seems insane to me. A banker and a lawyer from Switzerland were indicted Thursday on fraud charges for allegedly helping rich Americans evade taxes by hiding assets in Swiss banks, including UBS AG and a smaller Zurich-based institution. Among the allegations in court documents against banker Hansruedi Schumacher, 51, and 42-year-old attorney Matthias Rickenbach is that they told a New York businessman they paid an unnamed Swiss government official a $45,000 bribe for information on whether the businessman's account would be revealed to U.S. investigators. Schumacher and Rickenbach each face a single charge of conspiring to defraud the U.S., which carries a potential five-year prison sentence. Prosecutors said both men remain in Switzerland, and it wasn't immediately clear if they had U.S. lawyers to represent them. The indictment comes one day after the Swiss and U.S. governments unveiled an agreement in which UBS will divulge names of some 4,450 wealthy Americans suspected of dodging taxes through secret bank accounts. Many of those people, and the bankers and attorneys who advised them, could also face criminal charges. And from the last post, we're debating Plaxico Burress' two year sentence in the comments. Go post your thoughts. I had a lengthy debate with some friends today about whether Plaxico Burress' sentence was the right result or not. (If you aren't familiar with the case, here's some background). How do you feel about Plaxico Burress' two year sentence? I hereby challenge Justice Scalia to a debate on whether Catholic doctrine permits the execution of a factually innocent person who has been tried, without constitutional flaw, but whose innocence is clearly established by new and indisputable evidence. Justice Scalia is always willing to debate issues involving religious teachings. He has done so, for example, with the great Rabbi Adin Steinsaltz, and with others as well. He also has debated me at the Harvard Law School. Although I am neither a rabbi nor a priest, I am confident that I am right and he is wrong under Catholic Doctrine. Perhaps it takes chutzpah to challenge a practicing Catholic on the teachings of his own faith, but that is a quality we share. I invite him to participate in the debate at Harvard Law School, at Georgetown Law School, or anywhere else of his choosing. The stakes are high, because if he loses—if it is clear that his constitutional views permitting the execution of factually innocent defendants are inconsistent with the teachings of the Catholic Church—then, pursuant to his own published writings, he would have no choice but to conform his constitutional views to the teachings of the Catholic Church or to resign from the Supreme Court. Dersh is one of the best debaters around as is Scalia. I would pay an awful lot to see this matchup. Hat Tip: ATL. SECOND UPDATE -- A friendly reader points out that it is "interesting that the dissent which sparked the SCOTUS ruling was issued by a former Catholic nun (Judge Barkett)." But Judge Moreno's best case forever isn't over. He wants further briefing (and potentially a further hearing) on the issue of whether she has to repay any part of her $1 million compensation. Yay, more Paris Hilton in federal court. A former Swiss banker should get a sharply reduced prison term for helping the U.S. government as a star witness in a wide-ranging tax evasion investigation of banking giant UBS AG, federal prosecutors said Tuesday. The motion filed in federal court comes a week after U.S. and Swiss governments settled out of court to end an IRS lawsuit against UBS. Under that deal, the Swiss agreed to let UBS name at least some wealthy U.S. clients behind 52,000 accounts, information that had been protected by the country's vaunted bank secrecy laws. Assistant U.S. Attorney Jeffrey A. Neiman said in the motion that Bradley Birkenfeld, 43, had provided extensive cooperation. Because of that, he deserved no more than 2 1/2 years in federal prison, or half the five-year maximum for his guilty plea on a charge of conspiring to defraud the U.S.
Birkenfeld provided key information not only to U.S. prosecutors but also to foreign authorities investigating UBS, the Securities and Exchange Commission, the Internal Revenue Service and a U.S. Senate panel. "This substantial assistance has been timely, significant, useful, truthful, complete and reliable," Neiman said in the motion. in Davis’s situation who possesses new evidence conclusively and definitively proving, beyond any scintilla of doubt, that he is an innocent man. The dissent’s reasoning would allow such a petitioner to be put to death nonetheless. The Court correctly refuses to endorse such reasoning. Judge Barkett had explained to The New York Times that her dissents are fueled by “mostly frustration that I cannot make people see what I see." Hopefully, today's ruling gives Judge Barkett a small sense of satisfaction that her dissent succeeded in making others see what she sees. Looks like the storms are gonna miss us. Rumpole has been updating us all weekend on the positions of the storms. A tip for the future: keep an eye on the Herbert boxes. The blawgosphere is aflutter over the possibility of free PACER. (Thanks to MDO for the tip, but Miguel, shouldn't you be studying for the fantasy football draft?) I'm all for free access to the courts, but I've heard grumbling among lawyers that electronic filing has led to their pleadings being stolen and that making PACER free will lead to even more stealing. Isn't that the greatest form of flattery? SFLawyers makes passing reference to lawyers looking at Iqbal motions to dismiss. Is it me, or is SFL oddly obsessed with Iqbal. Yes, we had a Paris obsession here a couple weeks back, and that was strange, but this Iqbal craze is, well, strange. Rick Bascuas blogs about the en banc 11th Circuit looking into sentencing practices after giving discretion back to district judges. Apparently, the government isn't happy about below guideline sentences. Shock. Anyone trying any cases this week? 1. Prosecutors in Georgia are in hot water about their handling of a prosecution against a criminal defense lawyer. Friends of the blog Tom Withers & Craig Gillen represent the defense lawyer. They were part of the defense team that tried the Savannah case with me a couple years back. Good peeps. 2. Richard Simring's sentencing was postponed. Sad: "Richard B. Simring, a lawyer, was the chief legal officer of Okun Holdings, was also to be sentenced this morning after pleading guilty to charges of conspiracy to commit mail fraud and money laundering. However, Payne said he wanted a mental health evaluation conducted of Simring, who has a history of depression and was said to have been under a great deal of family stress at the times the crimes were committed. A new sentencing date for Simring has not yet been set. Payne said the five years called for under the plea agreement may be appropriate, but said he wanted more information about Simring’s emotional condition." 3. On Agusut 24, 2009, the Third District Court of Appeal will be holding an en banc hearing at Judge Moreno’s courtroom. The building's namesake -- Judge Wilkie Ferguson -- is a former 3rd DCA Judge. From what I understand, the case deals with PIP... UPDATE -- the argument has been cancelled. 4. Supervised release numbers are way up -- from 51,000 on supervision in 1997 to almost 100,000 now. Okun's co-defendant Richard Simring, who was a rising star here in Miami before this case, is scheduled to be sentenced this Thursday. Simring will get much less -- he pled to one count with a five year maximum and has been cooperating. His role was extremely limited, so hopefully he can avoid jail time. Interesting papers in the case. Here is Okun's sentencing memo, written by the FPD's office and Barry Pollack -- one of the finest white collar lawyers in the country. And here is the government's memo, in which it asks for 400 years. Hey everyone. I'm back. A big shout out to Vanessa Blum for filling in last week while I was out tending to the new Markus bambina. 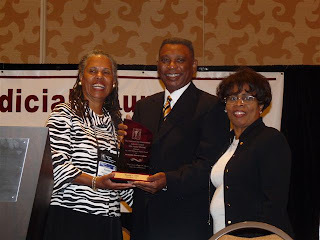 Judge Graham is back from his summer vacation and picked up the prestigious William H. Hastie award at the National Bar Association Convention in San Diego presented by the Judicial Council. Another NG for the FPD's office last week. This time Ayana H. and Sowmya B. pick up the win in an illegal reentry case. Good guy Dan Rashbaum has left the U.S. Attorney's office and has joined Matt Menchel in the Miami office of Kobre Kim. Closer to home, John Pacenti of DBR reports on alleged links between R. Allen Stanford, the Texas billionaire accused of running an $8 billion Ponzi scheme, and Tom Cash, former chief of DEA operations for South Florida. After leaving the DEA in 1994, Cash jumped to fancy private investigative firm Kroll as head of Latin American business. Two groups that hired Kroll to conduct due diligence on Stanford International Group are now crying foul, claiming the firm had a conflict of interest because it previously worked for Stanford’s companies. We don’t get to hear Cash’s side of the story. He apparently resigned from Kroll last month and is unreachable in the South Pacific. However, the article quotes Miami defense lawyer Jane Moscowitz and former U.S. Attorney Kendall Coffey singing Cash’s praises. As it happens, I know some folks who aren’t so fond of Mr. Cash. Earlier this year I quoted Cash in a Sun Sentinel article about the DEA moving its headquarters from Miami to the Weston. Cash thought it was pretty comical that his old agency was moving to the suburbs and predicted a possible backlash. “Most people do not believe we are desirable neighbors. We’re sort of next in line after pedophiles,” he said. I thought it was a funny quote, but it didn’t make me any friends at the DEA. It turns out federal law enforcement agents don’t particularly like being compared to pedophiles. Lesson learned. The Individual Plaintiffs, who live in diverse geographic areas within the state, offer a broad spectrum of experiences that collectively illustrate the alleged failures of Florida’s Medicaid system. . . .In the opinion of this Court, the prosecution of this case will benefit from the range of personal experiences. Lawyers from Boies Schiller & Flexner will argue, pro bono, on behalf of the class. The Florida AG’s office and law firm Kenny Nachwalter represent the Florida agencies. While we’re on the hot-button subject of government-run health care, Jay Weaver has this story about Medicare's proposed cap on payments to home health care agencies in Miami-Dade, which seem to be filing hundreds of millions of dollars in bogus bills for diabetic services. Still want a public health care option? Hi all and welcome to Monday! Vanessa Blum here, holding down the fort for DOM, while he welcomes his third daughter into the world. Is that guy a slacker or what? 1. First, in the name of shameless self promotion: Definitely check out my cover story in the DBR—a scintillating profile of Miami lawyer Stephen Zack, the first Hispanic attorney elected to head the ABA. Also from the DBR (this one’s John Pacenti’s): should biometric data, such as retina scans, be used to ID illegal immigrants? 2. Second, this isn’t a federal court story, but I can’t resist linking to Paula McMahon’s Saturday article from the Sun Sentinel: Is a severed head found in Broward County enough to trigger local jurisdiction? Broward prosecutors said that even though it's unclear where the 41-year-old was killed, the only part of her body that was recovered was found here and that under Florida law, that is sufficient to prosecute the two men charged here with her murder. The defense argued that her body wasn't recovered and that it's more likely she was killed in New York. They hope Circuit Judge Michael Gates will rule that Broward prosecutors don't have legal jurisdiction to prosecute the case. That’s all for now folks. I’ll be here all week, so e-mail news to vanessabblum@gmail.com.